If you're like me, you're always wondering if your blog is set up to be reader friendly, easy to navigate and well pretty. You change the colours, the template, the share buttons. And you judge your choices by examining it on the device you worked it all out on. And if you're like me, you have been mindlessly oblivous to your blog's appearance on other devises and more or less content with the way your blog is set up. Then I read an article by Greg Hickman. Awww! 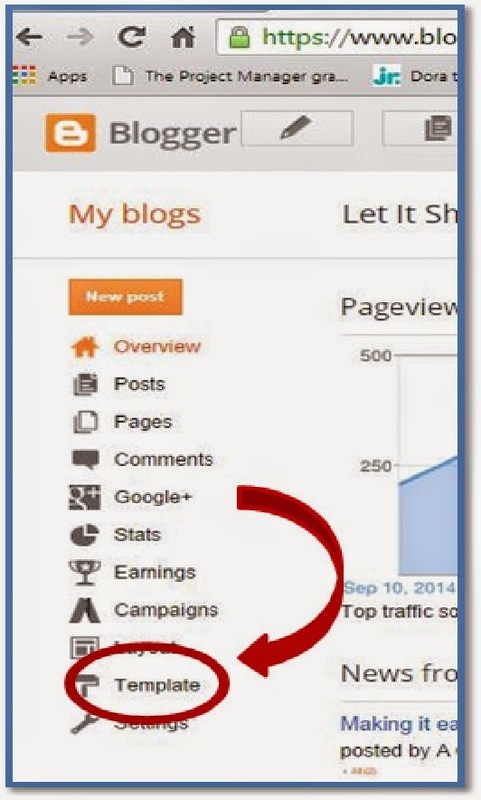 What do you mean I may be losing up to 50% of my traffic? Is my blog mobile friendly? Apparently more people are accessing the internet on some sort of mobile device than ever before and that number will continue to rise. 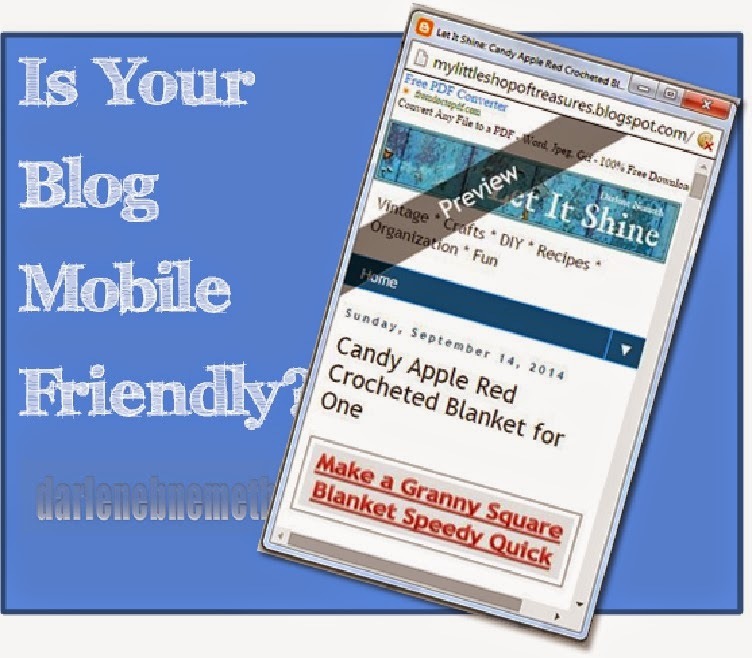 So you better be sure your blog is user friendly on mobile devices. How can you tell if your blog is set up properly? Greg explains it all in his article. That is if you're using wordpress. If you are interested click HERE to read the whole article. For those who use blogger follow these simple steps. 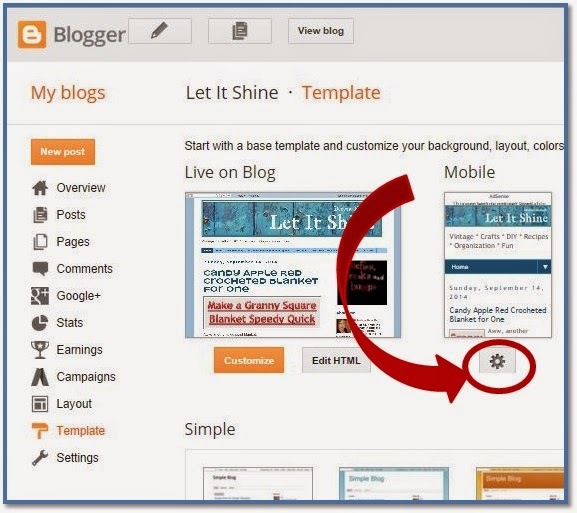 Sign into your Blogger account and go to TEMPLATE. This is the window that opens. Click on the star below the Mobile screen shot. This is the new window to open. Easy so far isn’t it. Do you see that spot where you are given a choice? 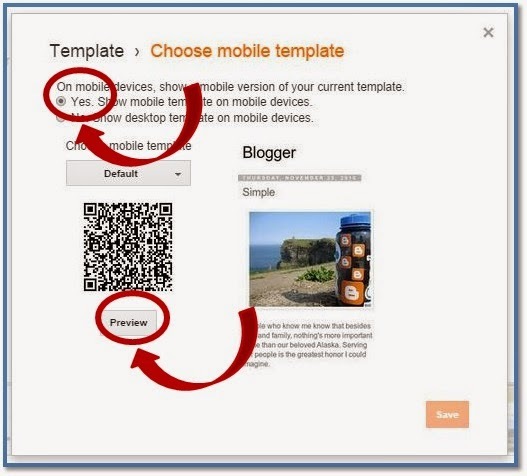 You want to click on Yes, Show mobile template on mobile devices. Now just click on the preview button. Ta Da! There you go. Check it out. I think mine looks pretty good. Phew! What a relief. I almost had an anxiety attack thinking no one can read my blog on their cell phones. I'm safe. But to be sure I will have to check it out on someone's phone. Oh, oh. That’s great, my blog posts can be read easily but if someone wants to share on twitter, pinterest or facebook... they won’t be able to. If I want sharing, (if right eh?) then I should add a pop up window. But I'll take care of that later. 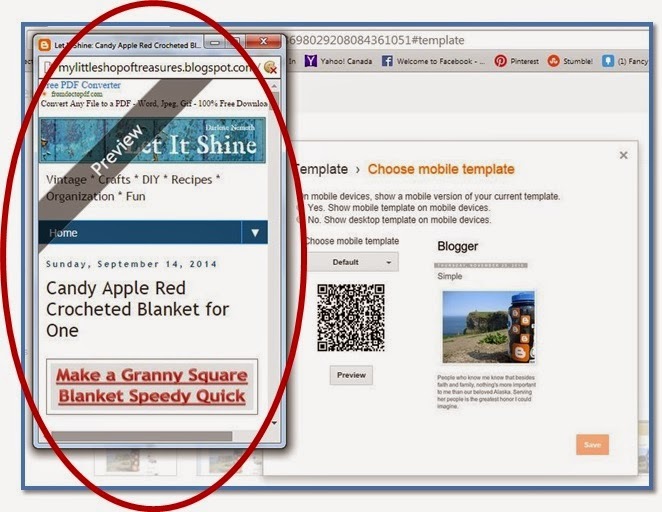 Hope you come back to see detailed instructions on how to add a pop up window on Blogger. Well thanks for stopping by. I hope my tips are helpful. If you like this post please feel free to share the love or opt to follow along on one of the social media platforms. Those friendly little buttons are on the right side bar. Hi everyone. I thought I would do something different today. I really don`t like cooking anymore. My daughter, Nicole does it now. I am so grateful for that. But I do like to eat and of course I have some favorite recipes. I know, this is not a blog about cooking but I thought it might be fun to share this Recipe for Unhappiness with you today. Everyday, take your pen and paper to write a list of everything that has ever gone wrong in your life. Remember to include those times someone has let you down, hurt you or betrayed you. Never feel gratitude or count your blessings. It is easier to take your home, family and friends for granted. Avoid getting a good night`s rest. Use any means available to keep yourself awake - lots of coffee helps. Sleep deprivation is a myth. Take those lips and maintain a frown. After a while you face will stay like that. At least that`s what my Mom use to say. Never go outside and take a breath of fresh air. Stay clear of the sun by remaining indoors with the curtains drawn. SAD (Seasonal Affective Disorder) is not real. Do not exercise. Be lethargic. Scientists have not proven a link between exercise and a healthy state of mind. Allow your mind to wander into terrible memories and thoughts of futuristic scenarios of doom and gloom. Never stop and live in the moment. Indulge in self destructive behavior, negative thoughts and pessimism. Watch or read and pour all your energy into an endless stream of news about tragedies, inhumanity, destruction and disasters. Be sure to never share, be polite, volunteer or think of the other person. Once these are combined, let it set and brew. Enjoy your miserable life and serve to everyone you know. Happiness is more about your attitude than it is about the circumstances in your life. 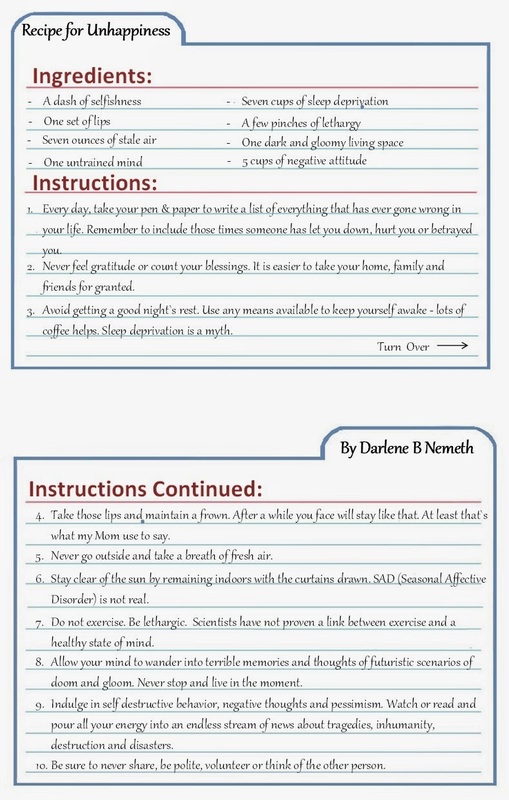 Here is a recipe card for you to print out. Enjoy. Well thanks for stopping by. I hope you enjoyed my Recipe but I hope you never try it out. If you do please let me know how it works out for you. Feel free to share the love or opt to follow along on one of the social media platforms. Those friendly little buttons are on the right side bar. I first heard about this company a few years ago. I loved their message. Life is Good. Spreading the power of optimism. When I saw the chance to be a part of their affiliate program I jumped on it because it is one more way that I can spread the optimism with you. Because Life Is Good! Bert and John Jacobs are brothers and co-founders of Life is Good. They struggled for five years selling their t-shirts. Then one day they decided to print "Jake" on their t-shirts. "Jake's contagious grin, simple as it was, seemed to express everything the Jacobs brothers believed in." "Soon Jake was introduced to local retailers, and his simple message of optimism was embraced like nothing the brothers had ever seen." Their company has grown and now offers a wide variety of items. When you have some time, check it out. Life is good has an amazing offer for Mother's Day: Enjoy any Crusher Tee, Apron and Mug for $50 + Free Shipping! This Mother's Day, Give Her the Gift She will Brag about to Her Friends...And to Her Friends' Friends... And Maybe the Supermarket Checkout Personnel. Optimistic gifts for every mom on your list. Shop now for tees, aprons, socks, mugs, tablet covers and sunglass cases. Please note: This offer excludes Stack-Happy Mugs. For a limited time, Life is Good also has available their popular Boston Love Wins collection of tees! There are currently five styles and colors available for men as well as women. Last, Life is Good has a catalog that includes 3,000 products! Life is good donates 10% of it's net profits to kids in need.